MADRID (AP) -- It's being billed as Spain's "trial of the century": A dozen politicians and activists are in in the Supreme Court on Tuesday stemming from their involvement in Catalonia's push for independence in 2017. The defendants face charges including rebellion and sedition in a proceeding that is being televised live and expected to last at least three months. It could set the course for the Catalan secession movement and the tone of national politics for years to come. The charges stem from the Catalan independence referendum on Oct. 1, 2017, that the regional government held in defiance of Spain's Constitutional Court judges, who ruled the vote was illegal. Separatist lawmakers in the wealthy northeastern region that includes Barcelona declared victory and independence 26 days later, but received no international recognition. Within hours, then-Spanish Prime Minister Mariano Rajoy dissolved Catalonia's parliament, removed the region's president and his Cabinet from office, and transferred their duties to Madrid. The regional president, Carles Puigdemont, fled Spain with several other officials and turned up in Brussels on Oct. 31. He avoided extradition after his arrest in Germany when a court there refused to send him back to Spain to face a charge of rebellion. Nine other separatist leaders who stayed in Spain were put in pre-trial detention as flight risks. Three more defendants remained free on bail before the trial. The trial is the result of a political crisis that is rooted in an earlier Spanish court ruling. Catalonia enjoys broad authority to self-govern, but in 2010, Spain's Constitutional Court struck down parts of a new regional charter that referred to Catalonia as a "nation." The ruling helped bolster the ranks of the separatist movement. In 2015, lawmakers passed a motion to start down the secessionist path and pledged to ignore any more adverse decisions by Spain's courts. That triggered Spain's deepest political crisis in decades less than two years later when the region pushed through two laws to allow an independence declaration via results from the banned referendum. A little less than half of voters in the region of 7.5 million support pro-independence parties. The separatists on trial include ex-Catalan vice president Oriol Junqueras; activist-turned-politician Jordi Sanchez, activist Jordi Cuixart and the former speaker of Catalonia's regional parliament, Carme Forcadell. The other six men and two women were members of the Catalan regional cabinet. Junqueras faces up to 25 years on charges of rebellion. Cuixart, Sanchez and Forcadell face 17 years. Some face the lesser charge of disobedience. The former government members also face fines if found guilty of misuse of public funds for the referendum. Rajoy, the former prime minister, will be one of more than 500 witnesses called to testify. WHAT DOES IT MEAN OUTSIDE SPAIN? If part of one European nation seeks independence inside its borders, there can be a ripple effect across the 28-nation bloc. Since each country usually wants to stay united, it would hesitate to support a secessionist movement in another that might inspire independence movements at home. When Scotland voted to remain in the United Kingdom in 2014, the fact it was allowed to put secession to a vote proved to be a huge boost to the aspirations of Catalan separatists. Among the secession-minded movements elsewhere in Europe are the Basques in both France and Spain; the Corsican and Breton regions in France; and the Flanders region in Belgium. One of the issues that has raised eyebrows is the fact that the far-right political party Vox is part of the prosecution. Vox is acting as the "popular prosecution," a peculiarity of Spanish law that allows individuals or entities to take part in certain criminal cases even when they haven't been directly harmed by the accused. A central issue of the trial is whether the separatists used violence in their breakaway attempt. Without violence, the charge of rebellion won't stick. State prosecutors and Vox will argue that violence occurred when the accused allegedly incited protesters to trash police cars and impede police officers from leaving a government building in Barcelona during raids ahead of the referendum, and that police were injured in clashes with voters while seizing some ballot boxes used in the banned referendum. The central government's attorneys, who are also the third prosecuting party, decided not to seek rebellion when a new socialist administration took power and started a dialogue with Catalonia's ruling separatist parties. Instead, the state attorneys will try to prove the lesser charge of sedition, which doesn't require violence and carries shorter prison terms. After testimony and arguments conclude, announcing the verdicts and passing sentences could take several months more. The verdicts will be open to appeals by both the defense and prosecution. 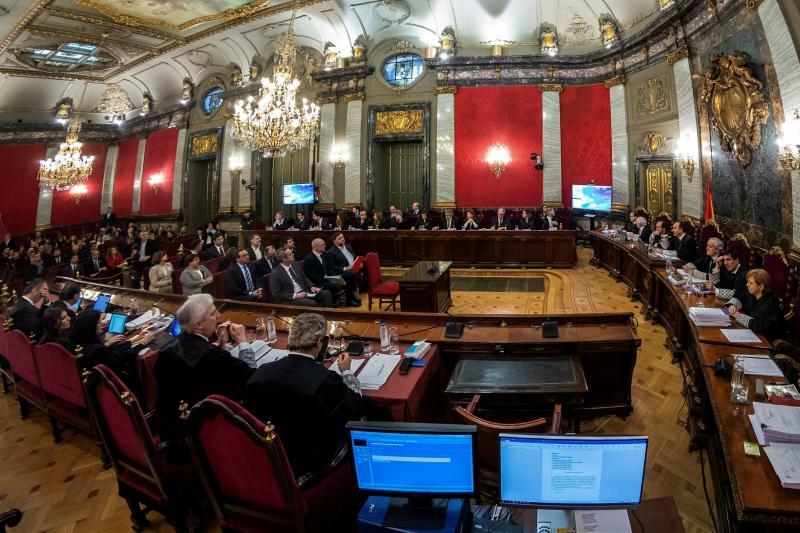 Once efforts are exhausted, the defense can bring a violation of basic rights complaint to Spain's Constitutional Court, and then the cases can be taken to the European Court of Human Rights. The national government can also pardon a defendant who formally requests it following a conviction and a show of repentance. Wilson reported from Barcelona, Spain.